They did not eat or drink during that time, and on the third day simply turned and walked off as mysteriously as they had walked in… leaving animal behavioural experts still mystified to this day as to how the beasts on separate reserves so far away would sense the “Elephant Whisperer” was dead, and make their way together to his home. Lawrence Anthony was born in South Africa, and loving its wildlife bought the Thula Thula Game Reserve in the mid-1990s. It was soon after, that nine wild elephants escaped their enclosure and as they wreaked havoc on farms and in villages, owners demanded their shooting. He talked softly, calmly for what seemed hours, and eventually Nana lowered her trunk, relaxed her body muscles and, in Anthony’s own words “turned and melted into the bush,” her herd following loyally behind. 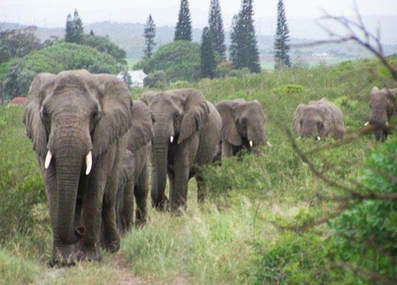 PHOTO: Over 30 elephants walked twelve hours from their reserves to stand outside the home of the “Elephant Whisperer” to mourn his death, not eating or drinking for two days before turning and wandering twelve hours back to their reserves.